Rebels in the Democratic Republic of Congo have won a series of military victories against army forces. Some rebels are now perched on a hill overlooking a densely populated town only 30 kilometers from the regional capital. Selah Hennessy reports for VOA from Goma that the rebels say they want to hold talks with the government. Only days ago, the Congolese army was celebrating a rapid advance against rebel forces in Congo's eastern province, North Kivu. But in a sudden turn-around, the insurgents, led by renegade general Laurent Nkunda, have retaken all the villages they lost last week. Now, a group of Nkunda's men stand on a grassy hill overlooking the large town of Sake, around 30 kilometers northwest of the regional capital Goma, the same place they controlled before the government's 20,000-strong offensive began last week. The insurgents say they want to hold talks with the government to resolve the situation politically rather than militarily. But General Indrajeet Narayan of MONUC, the United Nations peacekeeping force in DRC, says the army is consolidating its power and will come out stronger than it has been. "Reversals take place in war. Sometimes you have victories, sometimes you have reversals," he said. "I am sure this reversal is a very temporary reversal in nature. The FARDC [government forces] will consolidate and will come out stronger than ever it was." Speaking from one of the many grassy hills surrounding Sake, Narayan says the town is safe and its population should return home. He says U.N. and army forces have Sake surrounded, and the insurgents will not be able to take the town. Residents of Sake had fled the fighting. 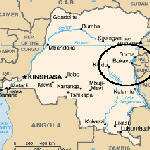 On Wednesday, thousands of people could be seen lining the road that heads toward Goma. They were walking slowly, weighed down by wood, fuel, babies, and food. Narayan says protecting Sake's population is a priority for the national army and MONUC. "We have to secure Sake, because if we allow the negative elements to come inside Sake they will carry out a lot of looting, plundering, and a certain amount of the civilian population which is there will get trouble," he said. "And probably then they will move onto Goma." Rebel and army forces have clashed in a series of armed conflicts since late August. Rebel leader Nkunda says he is fighting to protect local ethnic Tutsis from Rwandan ethnic Hutus. General Narayan says over 100,000 civilians have been forced to flee their homes in the last few days.